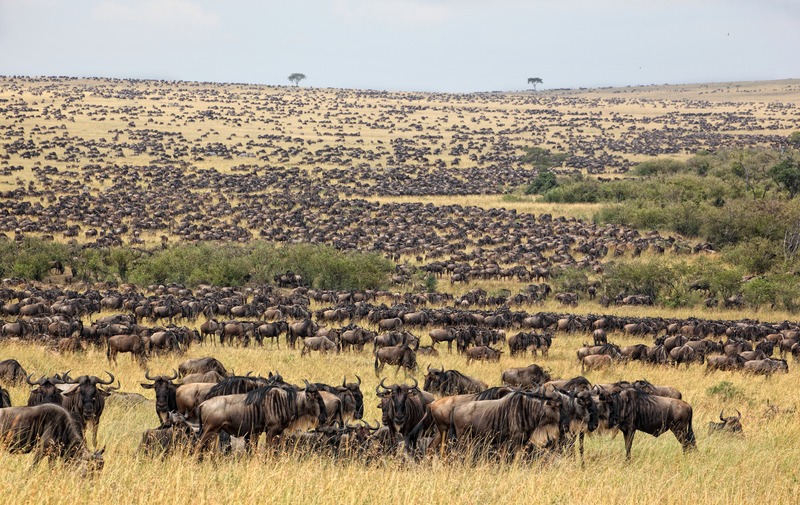 When you talk about Serengeti, great wildebeest migration is the first picture reflected on your mind. This incredible 5 days safari will take you to the inner part of Serengeti where your wilderness thirst will be cured. You will spend your nights at comfortable luxury safari tented camps as well as lodges. Upon your arrival at Kilimanjaro International Airport, our representative will pick you to Lake Duluti Serena lodge for dinner and overnight stay. In the morning after hot breakfast at Duluti Serena lodge, driver guide will take you with your packed lunch boxes heading to Kilimanjaro/Arusha airport for flight to Serengeti. After 1 hour you will reach central grass plain the Seronera region where our driver guide will pick you from airstrip ready for a game drive. Serengeti is famed by its natural phenomena of great wildebeest migration and a large number of wilderness big cats. Other animals commonly found in the park include topi, eland, hartebeest, buffalo, elephant, caracal, serval, bat-eared fox, hyrax, genet, hares, porcupine, aardvark, giraffe, jackal, mongoose, crocodile, monitor lizard, aardwolf, many kinds of primates including baboons, vervet and colobus monkeys, and over 500 species of bird. You will reach Seronera in the afternoon, after lunch, you will explore game drive at Seronera central grass land of Serengeti, in the evening you will depart to Serengeti Acacia camp overnight stay. After early breakfast at the camp, driver guide will take you and proceed with another marvelous game drive at Seronera the heart of Serengeti. In the afternoon you will enjoy a hot lunch at Acacia camp before proceed with afternoon game drive until evening. The endless grassy plains (Serengeti in Maasai) are the richest grazing grounds on the continent, and therefore home to the largest herds and the highest concentrations of predators on the planet. In the evening you will enjoy your night and dinner at Serengeti Acacia camp. In the morning depart for another awesome game drive at the southern grass plains of Serengeti near the Ngorongoro Conservation Area. During the months of February to April, the migration uses to be in this place. You will reveal the game drive at the southern grass plains, in the afternoon enjoy the delicious lunch box in the wild, and while in the evening depart to Ndutu Safari lodge for dinner and overnight. Meal and accommodation at Ndutu Safari lodge. Enjoy an early breakfast at Ndutu safari lodge, and then proceed to explore more about great wildebeest migration in the calving season. Drive guide will take you to those areas where a large number of wildlife including big cats and enjoy the full day game drive. In the afternoon you will enjoy your delicious lunch box at Ndutu picnic site, and then proceed with game drive until evening where you will drive to Ngorongoro Serena lodge for dinner and overnight stay. In the morning, after breakfast at Ndutu lodge, you will proceed to enjoy the wild environment until 09:00 am when you will be transferred to Ndutu airstrip for flight to Kilimanjaro International airport where you connect with your international flight back home. That is the end of your luxury wilderness safari, thank you welcome back again. Meals & drinks: Breakfast (Lunch & dinner not included) Drinks are not included.